The 2015 median home price in the Highlands is $286,500. Average days on market is 36. Average price per square foot is $159. The area known as The Highlands is located just southeast of downtown Louisville starting at the end of East Broadway to the north and extending south to the Watterson Expressway The Highlands follows Bardstown Road a length of 3.2 miles. The Highlands was originally nicknamed "New Hamburg" by its German residents. The streetcar line started extending down Bardstown Road in the late 1800’s and ran until 1947, which brought a boom of real estate development with it. This resulted in some of Louisville's most diverse residential architecture along the tree lined Highlands streets. 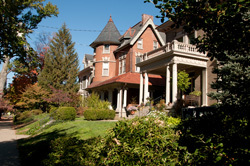 Ornate Victorian homes, Bungalows, Cotswold Cottage's and Craftsman styles are prevalent. Only minutes from downtown Louisville, KY The Highlands offers incredible convenience for those who work downtown or for students attending one of the many area schools. The median home price in the Highlands is around $286,500, about $159 per square foot; however, purchasing real estate in this area can be very pricey. For example, homes located on Cherokee Road are generally over the one million dollar mark. Real estate in the Highlands can be some of the most expensive in the city. 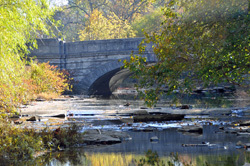 Some of Louisville’s most beautiful parks are located in the Highlands. This small space houses Tyler Park, Willow Park, Seneca Park, Douglas Park and the gorgeous Cherokee Park. Cherokee Park, which encompasses 409 acres and opened in 1892 was designed by Frederick Law Olmsted. His vision was to "Provide spaces where people can come together to create a stronger community". 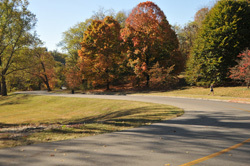 The Scenic Loop around Cherokee Park is a very lovely stretch of road, of about 2.4 miles. Residents from all around Louisville enjoy walking, riding, hiking and driving this loop. The Highlands also has a thriving nightlife. There are probably more restaurants and bars located along the 3.2 miles of Bardstown Road than anywhere else in the city of Louisville. Most restaurants along Bardstown Road offer al fresco dining, which is particularly entertaining due to all the pedestrians walking and shopping. Some of the most popular people-watching venues are Molly Malone’s, Ramsi’s Cafe on the World, Cafe 360 and Heine Brothers Coffee, just to name a few. O’Shea’s Irish Pub, Flanagan’s Ale House, Cumberland Brews and Wick’s Pizza Parlor and Pub are popular bars located in the Highlands. The Highlands is different from all other Louisville areas, and is proud of it. There is a saying in Louisville, "Keep Louisville Weird", being different is really what the Highlands is all about. The businesses all have their unique charm and the restaurants and bars have a different vibe to them than anywhere else in the city of Louisville. The residents are also unique in their own way. They are artists, athletes, hipsters, lawyers and doctors all with their own unique sense of style. The Highlands is truly a one of a kind place to live. Highlands Louisville, KY Real Estate listings are included above. These homes for sale in the Highlands, a neighborhood just East of Louisville, Kentucky, are updated every day from the Louisville MLS. If you have any questions about any of these homes for sale, just click the "Request More Information" button on any property detail page. We'd love to answer any questions you have.